My name is Gilleoin.I began to knit & spin at an early age and have always been fascinated by colour, texture,& the history & heritage of textiles. I come from a professional craft background and live in Midlothian, Scotland. 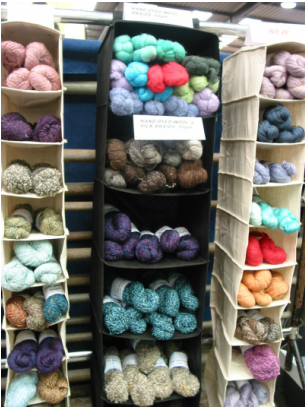 Woolrush Yarns evolved from my original knitwear business 'Calanas',set up in 1981,as a response to increased demand for my unique, high quality, hand spun and hand dyed Scottish yarns. Woolrush offers a range of different weights of yarn, made from natural fibres, most of which are sourced locally to my home in Midlothian. My two Knitwear collections 'Calanas' and 'Woolly Lamb' consist of patterns with completed garments available to order. My range of handmade Dorset Buttons is packaged in sets of 6 and many are one off sets as they are made from multicloured yarns. I also have a small range of fibre related jewellery. All products are individually designed and hand made by me.